Inspired by i09’s Death Week* and more specifically, their re-posting of Charlie Jane Anders‘ Ten Coolest Death Scenes in Science Fiction History, I got to thinking about how many characters bite the big one in pilots. Death often marks a beginning — often for the survivor learning to carry on, but sometimes even for the dead getting on with the afterlife. So, going to the great DVR in the sky makes a good event for a first episode. Here are some of my favs, in no particular order. Major spoilers after the jump. Lily Kane, Veronica Mars — The actually killing doesn’t happen in the pilot’s timeline, but the immediate aftermath is depicted; we have to wait all season for the payoff. The twins, American Horror Story — Those little bastards had it coming. George, Dead Like Me — Her death is so random, you have to love it: conked on the head by a toilet seat from space. And her demise is really when she starts living. Digby the dog, Pushing Daisies — Sure, some humans die in this episode too, but none as spectacularly as Digby. And lest you think I revel in the death of animals, he comes back to life. Heart warmed in the first 5 minutes. The drug dealers, Breaking Bad — To say that killing those two drug dealers in the RV is a turning point for Walter doesn’t even begin to describe it. On my first viewing, I was sure they were going to pop back up. But they’re dead as MySpace. The people on the plane, Fringe — You think the plane’s gonna crash. But instead something entirely more horrible happens. 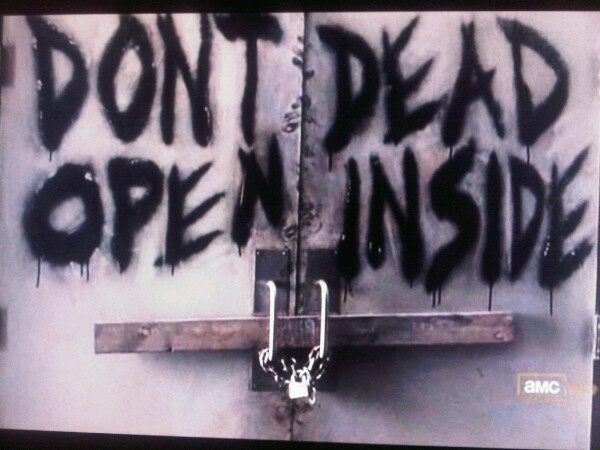 Everybody, The Walking Dead — “Don’t Open. Dead Inside.” So cool. Also, the half-woman crawling across the ground is a pretty sweet special effect. Feel free to add your tributes to the dearly departed in the comments. This entry was posted in 2000s, 2010s, About Pilots and tagged american horror story, breaking bad, deaths, fringe, game of thrones, pilots, Pushing Daisies, the walking dead, veronica mars by meekthegeek. Bookmark the permalink. The veronica mars pilot was incredibly strong, as was the whole first season. But they lost me after that sadly!